The VPI Prime Scout is the entry-level model in VPI’s core ‘Prime’ range of turntables, which consists of three models: the Prime Scout, Prime, and Prime Signature, the other two of which have already been very favourably reviewed in these pages. At £2,650 (plus cartridge and interconnect) the Prime Scout sits comfortably below the Prime in price, and comfortably up from the Avid Diva II that has sat happily in my system until fairly recently. It is evident some savings have been made from Prime to Scout, but it is also clear these have been carefully chosen to represent the minimum compromise over the Prime itself in performance terms. The most obvious difference is that the Prime Scout eschews the Prime’s 10” one-piece 3D printed tonearm wand in favour of a more conventional 9” three-piece aluminium construction, but it should be kept in mind that this is still the latest iteration of VPI’s classic JMW 9 Memorial unipivot tonearm, which remains among the very best I’ve heard. The Prime Scout also does without the ability to adjust VTA on the fly, having a much simpler armbase without that function. Arm height, and hence VTA, is adjusted at setup, and locked with grub screws in the usual fashion. This removes a degree of flexibility which might be useful if you have a mixed collection of different weights of vinyl, but adds simplicity, reduces cost, and probably represents a compromise most of us are happy to accept. I’ve heard the difference ‘correct’ VTA will make, and it’s not trivial, but as the retail price of the adjustable armbase and 3D arm wand alone is more than the cost of the Prime Scout, it’s clear that removing these allows the Prime Scout to occupy a different price point entirely. And it’s not like every other tonearm out there has easily-adjustable VTA, so when you haven’t had it, you don’t miss it. Other differences include a lighter plinth, vinyl-wrapped MDF bonded to a thinner steel plate than the Prime, simpler (but still adjustable) one-piece Delrin feet instead of the more sophisticated two-piece units on the Prime and Prime Signature, and a shallower, and hence less massive, aluminium platter. The rather gaudy platter mat remains the same, a screw-on record clamp is still provided, and the all-important main bearing is similar to the other models, albeit simplified. The 500 RPM (on UK models) motor is essentially common to all three tables, but with additional mass and damping on the more expensive variants. The distributor provided me with an Ortofon 2M Blue moving magnet cartridge at my request as I’m very familiar with it. Setup was very straight­forward, being mostly a simple assembly of the various boxed parts (the tonearm base is pre-fitted to the plinth before shipping), installing the cartridge and adjusting the geometry, arm height, tracking weight and azimuth using the excellent tools and protractor provided. Mind you, one aspect did cause a degree of unparliamentary language on my part. 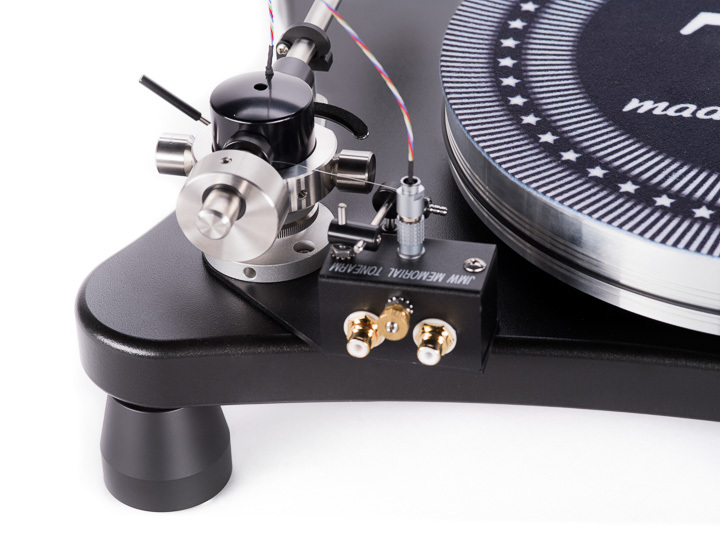 The JMW 9 being a unipivot design, azimuth suddenly becomes a potential issue and it is set by the simple expedient of locking the counterweight ever so slightly offset on its off-centre stub, to ensure the top of the tonearm sits level. The problem is that the counterweight is very free-floating on its stub, secured by a grub screw which needs loosening off for adjustment, so each time you shift the counterweight this way for azimuth, you also tend to move it a tiny bit that way down the stub too, thereby undoing the tracking weight you’d so painstakingly set. The result seems to be a variation on Heisenberg’s Uncertainty Principle, in that you can either have precise tracking weight, or accurate azimuth, but achieving both is well nigh impossible. So, n+1 cups of tea later, having finally achieved an acceptable compromise of accurate azimuth and close-enough tracking weight, I sat down to play some music.